When Is Your First Mortgage Payment Due? You might have heard that you won't have to make a mortgage payment for some considerable time after you close on your new home. That sounds good, but you're uncomfortable counting on it because you've worked hard to build good credit and you don't want to risk messing it up. So how do you know when your first mortgage payment is due? It's easier to figure out than you might think. By the end of your mortgage period, usually 30 years, your loan is paid off. Understanding amortization is the key to understanding how a mortgage works and when your first payment will be due. "Arrears" means money that was owed in the past. Mortgage interest is paid after it has accumulated, not before, so it's paid in arrears. Your first mortgage payment is paid at the beginning of the first full month after closing and every month thereafter so interest can accrue. Your June 1 mortgage payment would include the interest for the entire month of May. The opposite occurs when you rent a home. If your lease begins on June 1, your rent would be due on that same date because you're paying for the month of June in advance. The closing agent will collect interest from you up to 30 days before the first full month when you buy a home and obtain a mortgage. This interest will be listed on your closing statement and it's charged as a closing cost. This is important because a mortgage payment consists of two parts: interest and principal. Remember, interest is always paid 30 days in arrears. The principal portion of your mortgage payment is paid going forward and it reduces the principal balance you owe as of the date it is due and paid. Let's say your closing date is March 15. You'll be charged prorated daily interest from March 15 through March 31 on your closing statement. The interest collected at closing will cover the interest due on your mortgage for those last 16 days in March. Then your first mortgage payment will be due on May 1 and that payment will include the interest for April. Let's say you borrow $200,000 at 5 percent interest. Your monthly payment would be $1,073.64, payable in equal monthly installments for 30 years. You can calculate your daily interest charge for the time period prior to 30 days before the first payment is figured by taking $200,000 times the interest rate of 5 percent. Now divide that number by 12 months and divide the result again by 30 days. Your daily interest rate is $27.78. You owe 16 days of interest or $444.48, which you would pay at closing if you close on March 15. When you make a payment of $1,073.64 on May 1, that mortgage payment will pay the interest for April as follows: $1,073.64 less $833.33 (April's interest) equals $240.31, representative of the reduction in principal. If you subtract $240.31 from $200,000, your unpaid balance as of May 1 is now $199,759.69. 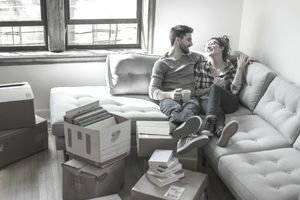 You'll most likely welcome the breather of time between closing and your first mortgage payment given the large sum of money you'll pay at the closing. But as you can see, you're not actually skipping any payments. You can avoid paying all that prorated interest out of pocket at closing if you close as near to the end of the month as possible, something you might want to consider. But it's all relative. You'll have a long hiatus before that payment comes due if you close at the beginning of the month, but you'd have to make a fairly substantial interest payment for that month at closing. To sum it all up: Technically, while it might seem like you're getting a month free of a housing payment, you really aren't.